Don't let the cold stop you from taking advantage of your outdoor space. Fall will soon come to a close and, depending on where your home is, you may be wondering if your patio will get any use until spring. 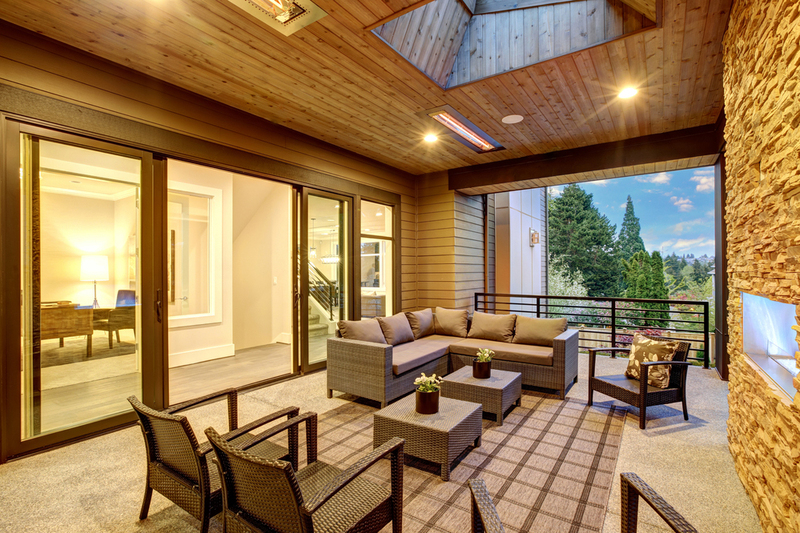 With the right features, however, your outdoor space may not have to go into hibernation. Here are a few ideas to help prepare your patio for winter activity. If your outdoor space doesn’t already have a roof, adding some sort of covering can help shield it from the elements. Patio roofs often extend from the home, but free-standing patio roof structures can also be quite stylish. While shade is nice, some creative designs include windows in the covering to allow light in. Louvered roofs that open and close are also great for any mood or season. Windbreak walls come in these styles as well to help block the cold without cutting off airflow or obstructing views of the yard. Adding an outdoor heat source can allow you to use your patio year-round, and there may be more options available than you realize. Heat lamps hanging from the roof can discretely provide warmth while a tabletop fire feature can become a powerful centerpiece. An outdoor fireplace can also tie an outdoor space together and may even double as a windbreak wall. For tighter budgets, fire pits, chimneys, and candles are less expensive heat sources that can be equally as stylish. Even with a heat source, the cold ground may make your outdoor space uncomfortable, particularly if the floor is stone or concrete. Outdoor rugs can provide a barrier under your feet and are made with a number of natural and synthetic materials to help them survive the weather. Radiant heating systems, while a more expensive option, can warm up the ground and even melt ice and snow when installed beneath flooring. Heated patio furniture can warm you up without redoing the floors. Short of that, weatherproof furniture with cushions can provide comfortable seating for you and your guests while surviving extreme weather. However, even waterproof cushions may need to be stored or covered when not in use. A variety of plants thrive through the winter and can add a touch of color to brighten up your winter wonderland. Kale, Swiss chard, and sweet box can keep your yard looking green as well as evergreen trees and hedges. Berry bushes and shrubs such as winterberry can dot the area with red. Even flowering plants are not out of reach in the colder months—snowdrops, camellias, and Christmas roses are just a few options to beautify your outdoor space.